In addition to our large collection of inflatables, we at Air Fair Entertainment have several exciting mechanical ride rentals that are sure to elevate your next party or event to a whole new level! 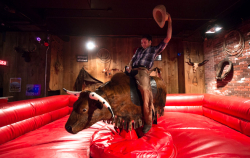 Your guests’ jaws will drop as they spot one of our mechanical rides waiting for them, whether you choose to go with our famous Mechanical Bull, the Zoofari Animal Go Carts package, the Ballistic Swing Ride, and more! Each rental comes with one of our professional staff members to oversee the ride, and we deliver all across New York and other surrounding states! Call us for more details, and don’t delay in making your mechanical ride reservation as the date of your event approaches! Our intuitive online booking system makes reserving your choice of party rental a breeze.